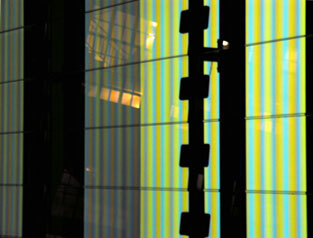 For 100 days this series of daily interfering abstract images appeared via internet parallel in different places. The Imachinations constitute a new ephemeral type of painting beyond painting: They are composed by two superimposing wave like patterns changing in colour and frequency based on an algorithm using the number of Pi. The project was presented for the first time as a huge (100 sqm!) 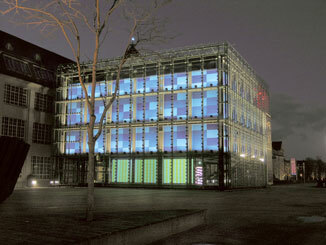 public projection in occasion of the cultural event program by the city of Kassel around documenta 11 from 8 June - 15 September 2002. 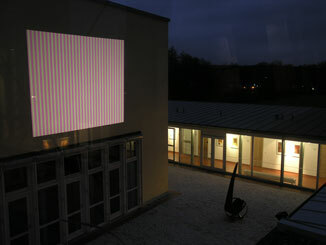 In parallel to the wall projection in Kassel the Imachinations appeared in a different media and social context as a screen presentation in a gallery in Munich. 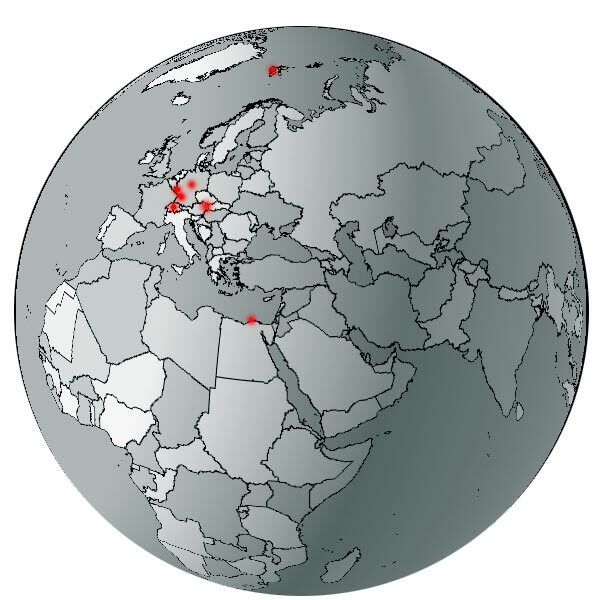 Although the images presented in Kassel and Munich are based on the very same data called via internet it shows how important it is even for ubiquitious web based images in which context they appear. Parallel to the Congress Bildwissenschaft - zwischen Reflexion und Anwendung (24-28 September 2003) the Imachinations appeared as backprojection on a projection nettel (ca. 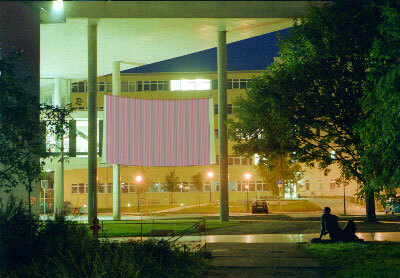 7 x 5 m) at the new building of the University Library of Magdeburg just beside the Institute for Simulation and Graphics. In occasion of the presentation also an extensive interview series with image theoricians and practioneers was initiated: reactive zone. 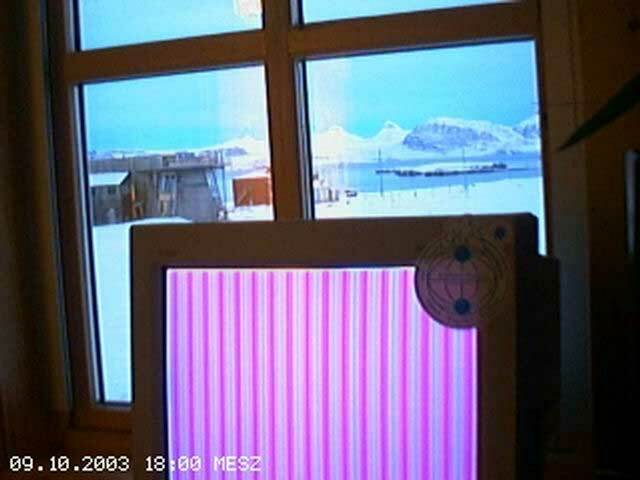 From 24 September 2003 till 02 January 2004 the Imachinations appeared for the first time in a scientific context at the most northern civil knot in the World Wide Web at the Koldewey-Station on the arctic Spitzbergen. First of all the Alfred-Wegener-Institute makes at the station atmospheric measurements with various instruments. 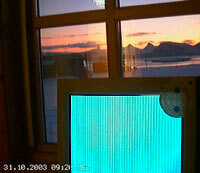 The Imachinations appeared as a screen presentation in the window of the seminary room looking to the Ny-Ålesund. For the head of the station Jens Kube images can have an objectifying character in the sciences: they free the imaging process from the eye and the hand of the painter. 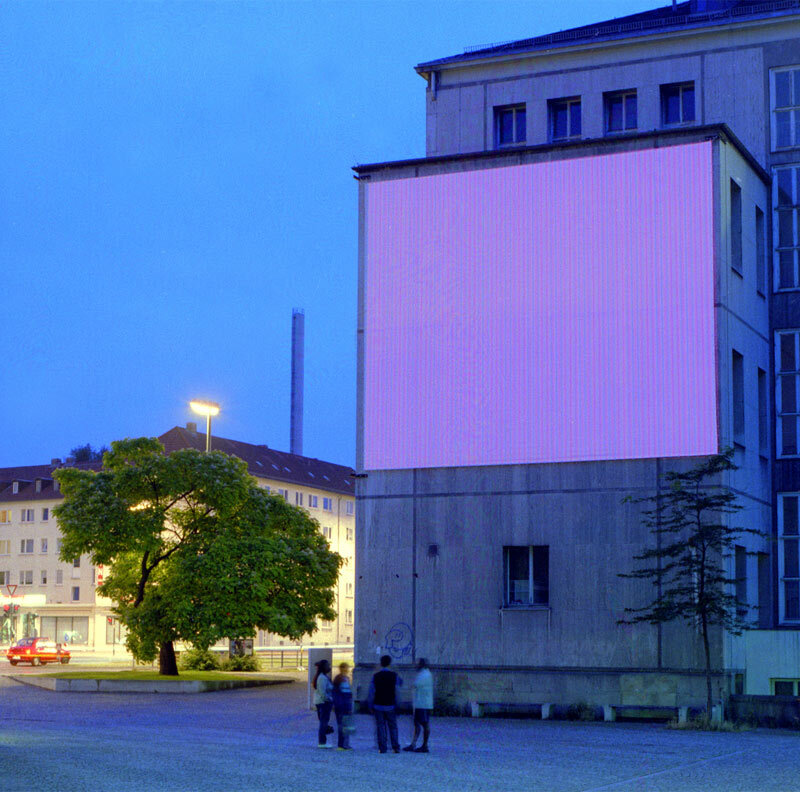 At the ZKM Karlsruhe the Imachinations were projected 24 hours around the clock, so even during daytime a dim image could be watched. Whereas as Beat Wyss compares the slowness of the daily changing Imachinations with Duchamps notion of retard, the ZKM's director Peter Weibel states: Emerging at the same time dislocated in different places the Imachinations are both - either original or copy. One image is not the reproduction of the other one. Though you see very obviously a radical challenge of the classical image, that is to say the notion of the original and originality. 100 Days - 100 Imachinations Schloß Dagstuhl (D), 2004/05. Schloß Dagstuhl in Saarland is renown for its weekly workshops where computer scientists around the world meet to discuss the latest topics in informatics. 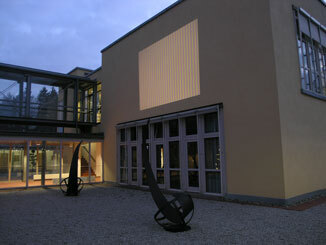 The Imachinations were presented in parallel to the ZKM presentation in the new monastery like extension of the castle. Thomas G. Dietterich points our the importance of images for him as a computer scientist: I am definitely the kind of person that requires an image or a diagram to understand anything mathematical, because the symbols by themselves don't help me very much. The director Reinhard Wilhelm states that data structures may exist without data as platonic idea . Parallel to the presentations at the ZKM Karslruhe and the Dagstuhl the Imachinations appeared from 29 January - 9 May 2005 at the "Top of Europe". Since the 1930's important discoveries in the fields of physiology, meteorology, glaciology, radiation, astronomy and cosmic rays have been made at the High Altitude Research Station Jungfraujoch in Central Switzerland. 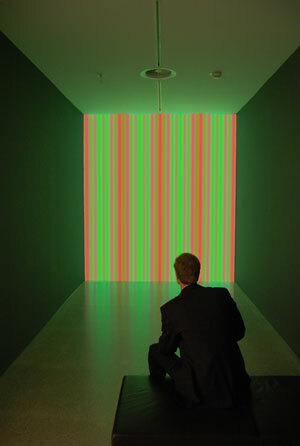 Laura Marks writes about the projection in Alexandria in her islamic genealogy of new media art Enfoldment and Infinity: These visualizations recall color field painting and the minimal light-based works of Dan Flavin. [...] What looks like an abstract pattern is an index of an unending process of mathematical calculation. 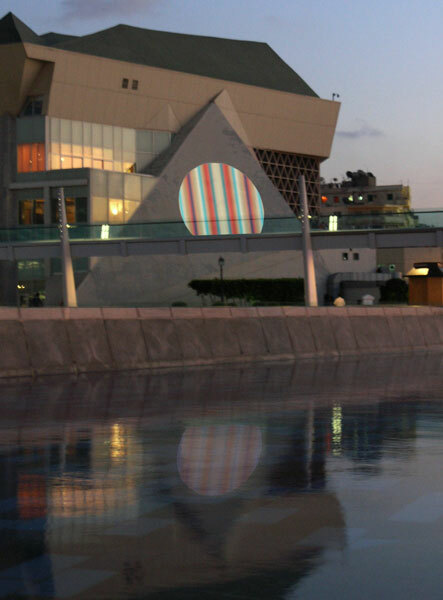 Lina Attilah resumes in the Daily Star: While the complex yet intriguing concept behind the project may not be very shared by everyone walking along the Alexandrian cornisch, the projection nevertheless influences them all. 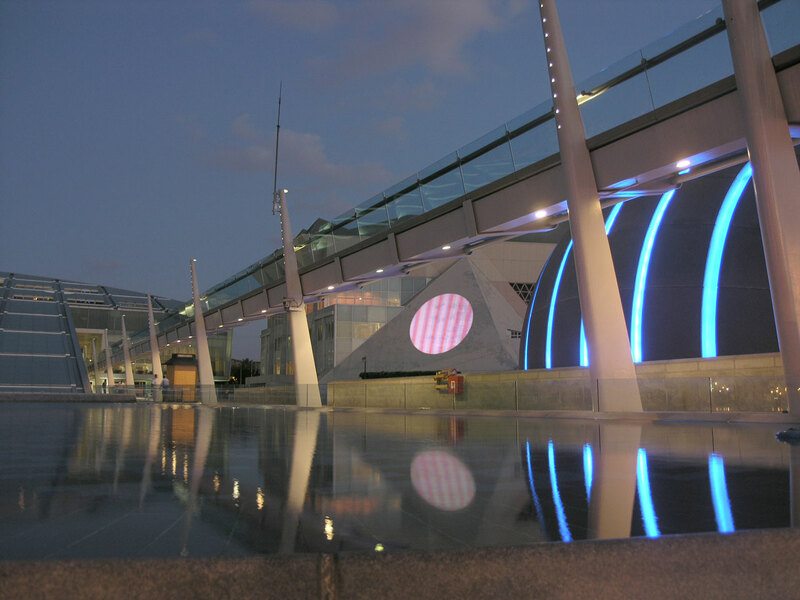 Besides it's visual appeal, it creates synergy between digital modernity and a constatnt interest in their city. 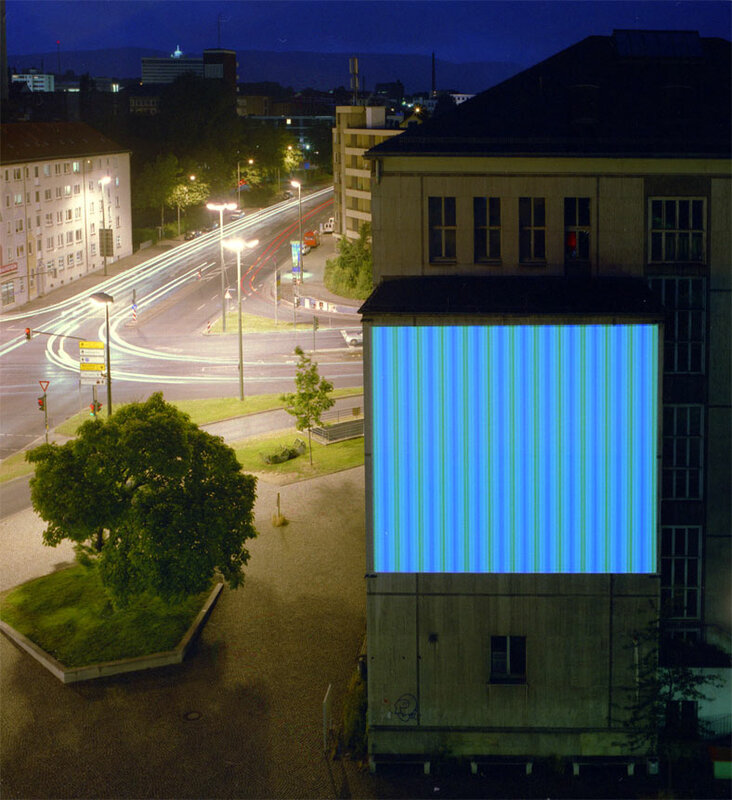 The Imachinations were presented from 28 February till 18 May 2008 at the exhibition Genau+anders - Mathematik in der Kunst von Dürer bis Sol LeWitt, Museum für Moderne Kunst Stiftung Ludwig Wien. 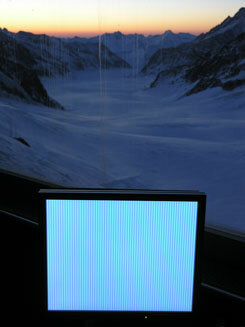 On 31 March 2008 Imachination N° 500 appeard at the museum in Vienna. 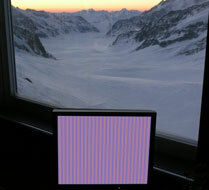 Curator Michael Rottmann writes: "Es entstehen in einer Sequenz digitale Bilder, die in ihrer Prozesshaftigkeit und Flüchtigkeit in einer Tradition der seriellen Kunst und der frühen Computergraphik stehen und die spezifischen Bedingungen von 'Digitalität' befragen: Was ist das Bild das wir wahrnehmen und wo entsteht es?"